I speculated in May last year that the introduction of the taper concept was in large part due to what Jeremy Stein articulated in February 2013, namely the idea that certain “markets” were becoming overheated in the “reach for yield.” In essence, it amounted to an attempt to “talk down” assets, chief among them the raging price appreciation once again in housing. 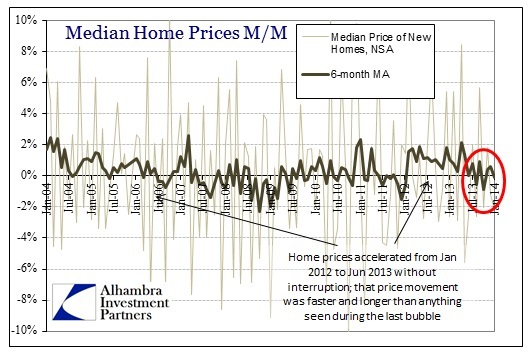 The inflation of home prices in 2012 and to that point in 2013 actually worked out to be at a faster pace, more importantly without interruption, than anything we saw during the main housing bubble in the middle of the last decade, so that certainly provides some solid context if indeed the FOMC discussions tended in that direction. I’m sure some will make the argument that was simply markets recognizing “value” after the bust, but you would expect a far more widespread participation if that was actually the case. The construction figures (in addition to sales estimates) show conclusively how incredibly narrow this price channel actually was, amounting to a mini-bubble in price without the volume. I would never expect any active FOMC policymaker to admit openly and freely that a bubble was anything other than historical, but some of them have come tantalizingly close on several occasions (including the most recent mention of small cap forward PE’s). The question presented is one in which policymakers always attempt to sidestep in public, namely if they could even recognize a bubble should they do anything about it. In the past, most, if not all, committee members proclaimed that they could not identify bubbles in the first place. Assuming past that initial problem, if they had any real-time clarity on bubbles, at best there is no clear methodology of defining a policy, and, at worst, that the FOMC should just ignore it because interruption is believed far too messy – bubbles are thought a matter outside of policy entirely, both cause and effects, because of monetary neutrality. How, then, should monetary policy react to unusually high prices of houses—or of other assets, for that matter? As a starting point, let me note that the issue is not now (nor during the stock market boom) whether policy should react at all.  As part of its analysis of demand in the economy, central bank models have long incorporated the wealth effect of house prices and other assets on spending; it is just one of many factors, including fiscal policy, exchange rates, and so on, that affect demand. The debate lies in determining when, if ever, policy should be focused on deflating the asset price bubble itself. In my view, it makes sense to organize one’s thinking around three consecutive questions—three hurdles to jump before pulling the monetary policy trigger. First, if the bubble were to deflate on its own, would the effect on the economy be exceedingly large? 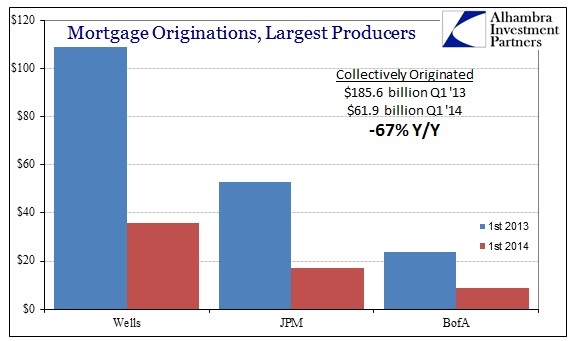 Second, is it unlikely that the Fed could mitigate the consequences? Third, is monetary policy the best tool to use to deflate a house-price bubble? My answers to these questions in the shortest possible form are, “no,” “no,” and “no.” In the most thorough possible form, my answers might take a few hours, and would give full play to the many gray areas that are involved. Her assessment of the first “hurdle” was likely based on their collective experience with the dot-com bust, particularly with regard to the extremely mild 2001 recession. The second is no doubt confusion in the “literature”, as surely they believe themselves with undue powers over economic control. The last is the most contentious, in my mind, because you have to see cause in order to divine prescription. But that was 2005, no doubt on the first “hurdle” the FOMC, and even most orthodox economists, have to be aware of how wrong they were. So it just may follow that there is a new collective assessment amongst the central planners. If Bernanke’s belated attempt at monetary responsibility was supposed to be a mild rebuke intent on gently prodding home acceleration, it hasn’t worked out that way. And even if that was not the intent, the results are all the same as there is clear evidence of bubble properties and taper causation through mortgage decimation. Mainstream commentary again continues to focus on the adjusted month-to-month changes absent all relevant context. 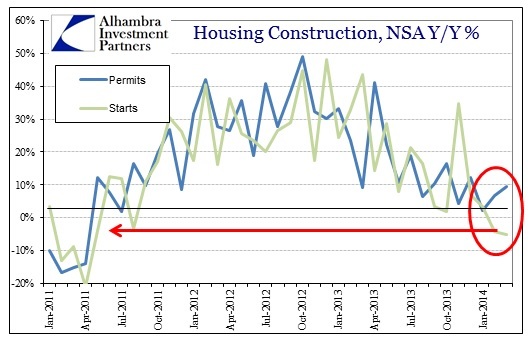 Home starts, including both single-family and apartments, have declined Y/Y for two straight months – the first time that has happened since April and May 2011 (at the onset of the mini-bubble). 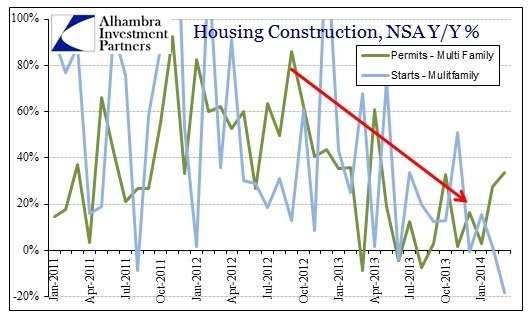 While permits rebounded slightly in March, they remain in the well-defined, narrow volatility channel (the zigzag pattern) established the middle of 2013. 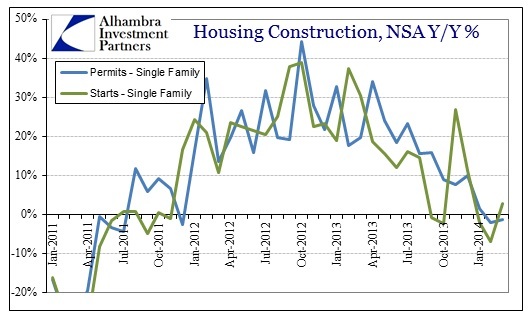 Separating construction by segment, the single-family space has clearly been deflated. The problem now is that this is forming another bust, smaller in scale for sure, but still with the potential to create a large drag on economic activity. 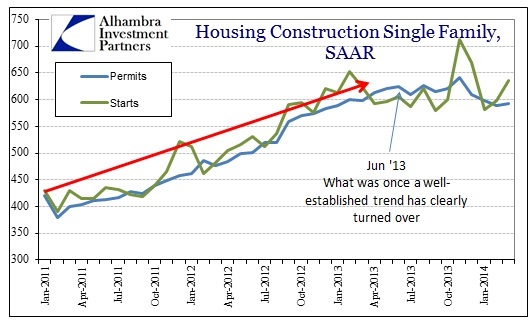 Can anyone craft and manage a housing “soft-landing”? While home price appreciation was clearly having an effect on the bubble trend by early 2013, there are also clear fingerprints of the debacle in mortgages. 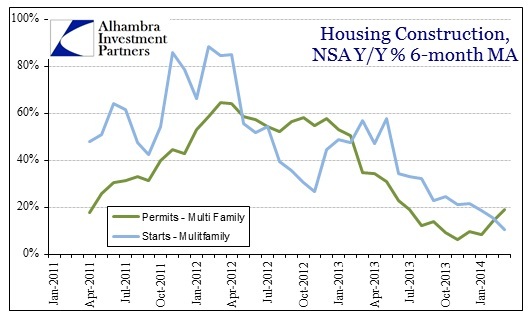 In terms of multi-family construction, typical volatility may obscure direct observation, but smoothing out with a moving average renders the trends there obvious as well. If taper was directed as an update to monetarist bubble philosophy, then we have arrived at the critical moment. The backslide in activity is evidently durable, so there should exist some means or measure of arresting that from trending toward more disorder. And it plainly needs to be instituted sooner rather than later. I sincerely doubt that is the case, as there is usually a haphazard nature to most ad hoc monetarisms (see all of 2007-12). Even assuming this was intentional on the part of the FOMC in mid-2013, I find it unlikely they had any plans about further direct management. Some of this pertains to their persistent over-estimation of monetary abilities, as clearly they still and stubbornly believe collectively in the efficacy of central planning despite all evidence to the contrary (that grows by the day). Rather, I think it somewhat likely that any attempt to mitigate the bubble’s downside would be kept within the larger policy structure, such as re-arranging POMO’s to the 10-year space, with the idea that would be enough. Among the 20 firms buying the most California real estate since January 2012, purchases are down more than 70% compared with last year in each of the last four months, according to DataQuick. At the 20 biggest foreclosure buyers, including arms of Blackstone and Colony American Holdings, purchases have fallen at about the same rate. Blackstone’s acquisition pace has declined 70 percent from its peak last year, when the private equity firm was spending more than $100 million a week on properties, said Jonathan Gray, global head of real estate for the New York-based firm.